Finney Elementary is one of 45 elementary schools in Chula Vista Elementary School District (CVESD). CVESD is the largest elementary school district in the state of California. The District serves approximately 27,400 students in grades K-6. Overall, two-thirds of District students are of Hispanic descent, and more than one-third of students are English language learners. This is 40 percent higher than the county as a whole. This year, 38 out of 45 District schools (including Finney) achieved Academic Performance Index (API) scores above the state’s 800 target. For the first time, five CVESD schools matched or exceeded 900 on the API, outperforming schools from Coronado to Carlsbad. The District’s overall index score of 848 reflects a double-digit year-over-year gain. Nestled in a small, low-income housing development, Finney Elementary currently serves 475 students in grade K-6. This will be Finney’s 50th year of educational service. A wide variety of programs are offered to meet the needs of all of our students. Among these are our Second Language Education Program with a Spanish-speaking teacher at each grade level, two full-day special education classes, a Resource Specialist Program, and a Super Citizen Program to promote positive school behavior. Located only a mile and half from the U.S./Mexico border, the student population is comprised of ¾ Hispanic or Latino ethnicity and ½ English language learners. More than half of Finney’s students are considered to be socioeconomically disadvantaged. Historically, parent involvement has been very minimal at Finney. There is a significant disparity between the school’s demographics and the district’s demographics, especially when looking at the number of English language learners in attendance. This is largely due to the location and surrounding population of Finney. At Finney, each grade level has two to three classes of 25 students in grade K-3 and one to two classes of 31 students in grades 4-6. The class size limit is stated to be 20:1 in grades K-3 in the district, but due to budget issues, it has crept up to 25. With a seemingly shrinking budget, the district is faced with tough decisions. Increasing class size is one of those decisions. The district is doing all that they can do to avoid having to cut jobs. Finney is a small school compared to other schools in the district. There are only 22 teachers, including special education. This makes for a very small and tight knit community. A handful of teachers have been teaching at Finney for their entire career, some for more than 20 years. The size of our teaching staff is both a positive and negative thing. It is positive in the way that staff members are very supportive and helpful. For the most part, teachers openly and willingly accept new members into the school. Most teachers are very friendly and eager to help and assist. New staff members are greeted with smiles and hugs. Since there are only 22 teachers, getting to know each other doesn’t take very long at all. There have also been long established relationships with several families at our school. The small teaching staff can be negative in the way that you are limited to the number of colleagues you can collaborate with. For example, my grade level is comprised of only three teachers. A few grade levels only have two teachers, and one grade level only has one teacher. If you don’t agree with your grade level colleague (and if there is only one other grade level colleague to work with), you may tend to isolate yourself and begin doing things on your own. However, there is currently a sentiment of change taking place on campus. With built-in collaboration times every other week, grade level colleagues are able to meet and discuss thoughts, ideas, suggestions, and concerns. This has helped with the isolated tendencies of many, including myself. Several teachers are realizing that there are many new techniques, strategies, and methods to reach our students, and are openly discussing them with their colleagues. Instead of resisting change, many are beginning to embrace it. This is slightly due to our steadily increasing test scores. When you can see the positive outcome of your new instruction in hard numbers, you are more likely to continue on this revolutionary path. The issue is helping teachers realize that change needs to take place before you have the data to back it up. The curriculum and instructional methods vary from teacher to teacher and grade to grade. There has been a push to have a more unified teaching approach so that students can build upon their learning in each successive school year. These district suggested teaching approaches include the Gradual Release of Responsibility model, utilizing the six-step writing process, extensive modeling, clearly posted and stated content and language objectives for all core subjects, and student friendly resource charts and sentence frames to foster English language development. Although teachers are able to teach in any manner they see fit, there is an overwhelming pressure to prepare students for the end of the year California Standards Test (CST) as well as other various district assessments throughout the year. This impacts teachers’ freedom to design creative and meaningful learning opportunities. Many teachers feel pressured teach to whatever test is looming closest in the horizon. The principal and other prominent district officials conduct several walk-thrus and during the year to make sure that all content standards are explicitly being addressed and that district teaching methods are being utilized. I am one of three second grade teachers at Finney. One of the teachers and myself teach English only in self-contained classes. Due to the high number of English language learners in both of our classes, much of our instructional time is spent working with small groups while focusing our instruction on English language development. The other second grade teacher teaches a bilingual class where half the instruction is in English and the other half of the instruction is in Spanish. As a grade level, all our students are mixed and rotated to different social studies and science classes throughout the year. This is to ensure that bilingual students have an opportunity to socialize with English only students and to ensure that each student has an opportunity to meet all grade level standards in social studies and science. Each teacher teaches the same subject, each quarter with a new group of second graders. This helps the teacher become an “expert” in the area, develop a higher confidence level regarding the subject content, tweak lesson plans that didn’t go well the first time, and modify activities that need restructuring the next time around. Since our students get an opportunity to rotate to different social studies and science classes, they get the opportunity to know each second grade teacher. Each second grade teacher gets the opportunity to meet and develop a relationship with each student in the grade level. As a collaborative team, we are striving to make sure our entire community of second graders progress and succeed as a grade level as opposed to just focusing on our own individual students and class. For example, I may be struggling with reaching a particular student in my class. I have only my take on the situation to assist me. By working in a collaborative community, my grade level colleagues will have a chance to work with this same student during one of their science or social studies rotations. They may be able to give me a different viewpoint or alternate information regarding my student that I may not have been able to gather on my own. By working together, we may be able to help this student overcome their struggles and succeed in future learning opportunities. • Learn skills necessary to develop their best possible selves and a positive attitude toward others. • Develop enthusiasm for lifelong learning. • Develop the basic academic and technological skills necessary to live a productive life. • Develop personal concern for preservation of natural and human-made resources. • Develop physically, intellectually, and morally. We are currently revising the language of our mission statement. The mission statement was written several years ago, and does not reflect the current expectations and aspirations we have for the students. Many of us have an issue with the line that states how we will educate students to “develop the basic academic and technological skills necessary to live a productive life”. We feel as if we should be striving to give our students more than a “basic” opportunity to live a productive life. This language makes me feel like I am preparing students to become successful cashiers or something of this nature. It’s time for the culture of our school to set the expectations and confidence level higher. Our Finney school values are discussed with students constantly and emphasized as well as incorporated into everyday education. The principal as well as teachers are consistently giving examples and reminding students and parents what our school values sound like and look like. We have recently decided to add an additional value of “safety” to the value list. We feel that without a safe environment, student learning will not occur and the goals of our mission cannot be attained. My class comprises 23 students, 13 girls and 10 boys. More than half are considered to be socioeconomically disadvantaged. To be considered socioeconomically disadvantaged, families must be earning less than $13,000 a year as a household. 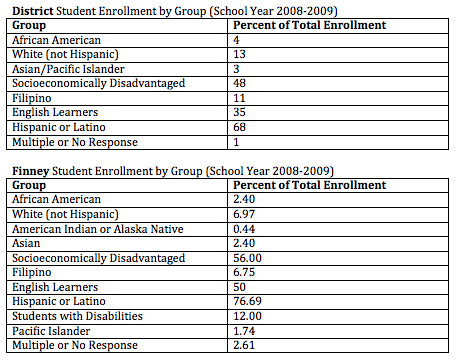 Thirteen students are English language learners, five have Individualized Education Plans (IEPs) for speech and language or learning disabilities/impairments, two of my students have been diagnosed with ADD, and four students are in the SST intervention process for consistent below grade level academics. Sixteen students are of Hispanic ethnicity, six students are of Filipino ethnicity, and one student is of African American ethnicity. Although my students are facing many challenges in their home lives and academic abilities, they arrive at school happy and enthusiastic for the day’s lessons and activities. They always have smiles on their faces and positive dispositions. This reinforces the notion that you don’t need a lot to be happy in life. My students’ resiliency inspires me to appreciate what I have, to be a more effective educator, and to be a better person in general. Being a fairly new teacher, I feel substantial pressure to impress my principal and other district officials. My teaching must consistently demonstrate how students are being prepared for the CST. I am currently working on my ability to merge both district standards-based curriculum AND project-based learning (PBL) so that the two can exist at the same time. Several teachers are focused on test preparation and are hesitant to incorporate PBL. They feel that PBL will take away from their instructional time and leave their students underprepared for the CST. I am hoping that I can find a way to present PBL to my colleagues as a way to ultimately enhance student learning. My students currently reside in a cozy little classroom in a far back corner of the school. We are sort of in our own world. Quite honestly, my room looks like a rainbow exploded on the walls. There is color everywhere and carefully organized chaos on all possible wall space. I often teeter between overwhelming stimulation and an energetic and colorful learning environment. When I walk into my room, I feel like I have escaped to some tropical oasis. I only hope that my students feel the same way I do. In the same respect, I might just be exasperating the attention/distraction issues many of my students struggle with since there is so much extraneous stimulation. My desks are arranged in groups of four students. I switch up the seating arrangement every couple of weeks in order to provide my students with an opportunity to work with all of their classmates. One kidney shaped group table sits towards the back of the classroom. Our classroom is equipped with five computers, a document camera (docu-cam), and a large television. We also have a class library with a abundant amount of leveled fiction books and categorized non-fiction books. In terms of instruction, our day is closely tied to district mandated instructional blocks. There is a strong emphasis on language arts and mathematics instruction, in order to prepare students for the CST at the end of the year. Our school’s current focus is writing, although this has been shifted more towards math due to lower math test scores within the district. As teachers at Finney, we construct much our own math program. We have realized that the math program we have been using for years is not appropriately servicing our students, but have been unable to get money from the district to purchase a new one. So, most teachers use aspects of this old program and map backwards from the CST to plan our math instruction. Within my own classroom, we spend more time on math than the district allotted time block (about 90 min. vs. 60 min.). I encourage students to arrive at their own conclusions and explain their mathematical reasoning for how they solved a particular problem. This is a very important practice for my English language learners. My students often work in small groups or in pairs and are encouraged to use manipulatives to help them show how they solved a problem. I also encourage my students to think outside of the box and to solve problems using methods other than traditional algorithms. I have very high expectations for my students in math and am confident that they all can score proficient on the CST, aside from their struggling academic backgrounds, native language, or learning disabilities. A large part of the day (about 2 to 3 hours) is spent on English Language Development because of the high numbers of English language learners. We focus on concepts such as phonics, grammar, spelling, writing conventions, and vocabulary. Due to the language issues and the low socioeconomic backgrounds of many of my students, a lot of time has to be spent on developing appropriate background knowledge on topics that may seem like common knowledge to many people. I have to show copious amounts of visuals and use extensive realia to show my students what things look and feel like. Many of my language arts lessons need to be scaffolded and designed so that students have ample opportunities for support and small group review. A small part of the day is reserved for science and social studies (Tuesdays and Thursdays for 35min.). Students rotate to different classes as discussed previously. Sadly, students only get to participate in art, music, and P.E. once every two to three weeks. Field trips and extra-curricular activities must be paid out of pocket by teachers due to limited funding. The number one comment I get during parent-teacher conferences is about how parents and students want to have more time participating in art, music, and P.E. activities. I’m contemplating starting my own after school art club to allow students more time to create beautiful work. I would love to dive in and do this, but I would have to do this on my own time using my own resources. I would also have to drive many students home because the majority of my students ride the bus or walk home with siblings right after school. An area I am focusing on is increasing parent involvement within the classroom. As stated before, parent involvement is very minimal at our school. I try to communicate frequently with parents. I like to call just to tell parents how amazing their children are and how happy I am to have them in my classroom. I engage in positive conversation whenever I see parents before and after school. I also started a Thanksgiving tradition where I cook two big turkeys and invite parents and family members into my classroom to have a Thanksgiving dinner. Last year, we had a great turnout and I saw a slight increase in parent participation after. I would like to start making home visits as well. I think this will help parents see how committed and interested I am in their children’s lives.